This family friendly event of bluegrass music is co-sponsored by the Mineral volunteer fire dept. Food and camping available at the park.A good time to be had by all. www.mineralbluegrass.com for schedule, performers and cost. This Family-friendly bluegrass festival is the place to enjoy 3-days of great bluegrass music. Food available at the park. Motels available in the area. Rough camping available at the park. WE ARE CELEBRATING 31 YRS. OF GREAT BLUEGRASS MUSIC jULY 17-19, 2014. THIS FAMILY FRIENDLY EVENT IS CO-SPONSORED BY THE MINERAL VOLUNTEER FIRE DEPT. FOOD WILL BE AVAILABLE AT THE PARK . RAIN OR SHINE EVENT. FOR TICKETS & INFO CALL: 540-672-3549; CAMPING: 540-894-9811. CHECK OUR WEBSITE www..com FOR PERFORMERS, SCHEDULE & COST. RAFFLES, PRIZES & GIVE-A-WAYS WILL ADD TO THE FUN TO BE HAD BY ALL. COME JOIN US. While you may have heard some buzz about the Mineral Bluegrass festival you will want to read some of the facts that make it one of the most loved events in the greatest city in the nation! Read below for the top 8 reasons you don’t want to miss out on the fun and excitement at this great event! This family-friendly event of bluegrass music is co-sponsored by the volunteer fire dept. We are celebrating 30 yrs. of great bluegrass music with raffles, give-ways and prizes to add to the fun to be had by all. Food is available at the park. Check our website www.mineralbluegrass.com for lineup, schedule & cost. 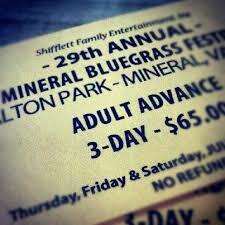 The 2014 Mineral Bluegrass Festival dates have been set for July 17-19. Previous bluegrass band line-ups have included: Jesse McReynolds & The VA Boys, Connie Smith, Charlie Sizemore Band, Goldwing Express, Larry Sparks & The Lonesome Ramblers, Bobby Osborne & The Rocky Top X-press, Ralph Stanley & The Clinch Mountain Boys, J. D. Crowe & The New South, The Grascals, and Marty Stuart & His Fabulous Superlatives. Offers several different ticket options including daily. Offers on-site camping option and local hotels. WE ARE CELEBRATING 31 YRS. OF GREAT BLUEGRASS MUSIC jULY 17-19, 2014. THIS FAMILY FRIENDLY EVENT IS CO-SPONSORED BY THE MINERAL VOLUNTEER FIRE DEPT. FOOD WILL BE AVAILABLE AT THE PARK . RAIN OR SHINE EVENT. FOR TICKETS & INFO CALL: 540-672-3549; CAMPING: 540-894-9811. CHECK OUR WEBSITE www.mineralbluegrass.com FOR PERFORMERS, SCHEDULE & COST.